Recently I had the opportunity to attend a very special book club meeting. 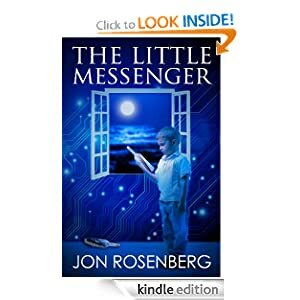 One of our members had invited her neighbor and local author, Jon Rosenberg, to talk with us about his book, The Little Messenger. Patterned after Dante’s Divine Comedy, this story has a familiar theme. We have to lose everything before we can truly find ourselves. We have to descend very low into the dark dismal depths before we can ascend into the light and understanding. Reading a book and then being able to talk with the author is priceless. If only I had this occasion after every book, I would understand so much more! How was I to know that Mr. Rosenberg had patterned his tale after a 14th century epic poem? How was I to know how profoundly the author’s life was changed by his own autistic son? He spoke with us candidly and openly, sharing not only his thoughts on the story, but also events from his personal life. He accepted all of our questions, and we had many, and answered them with grace and eloquence. He shared with us his personal philosophy that all of us must be sent through trials, the refiners fire, so that we can become stronger, better, and find peace. We asked if he believed in God and he answered, no, he is not a religious man, although what he said was of a spiritual nature because it touched us and spoke to our hearts. We asked how he got involved in writing and he answered that he had a story he wanted to tell and it took him eight years to write it. He self-published his book and it’s available on Amazon. Miraculously, he did mention plants. He presented them as an allegory. When things get really tough, we stretch and we reach and we grow, often quite painfully, until we get what we need. If a plant needs water it will send it’s roots out into the soil searching for it. The stems and leaves bend towards the sunlight, seeking out what they need. Challenges mold us. Just like the poem ‘good timber does not grow with ease, the stronger the the wind, the stronger the trees’ (Thanks Rachel!). He also suggested that pleasure is not the opposite of pain, but rather comfort is the opposite of pain. In pain we seek out change, with comfort we feel no need to make any changes. When we are comfortable, why do anything different? Yet in both situations, pain and comfort, we can find pleasure, or happiness. It’s up to us to find happiness as we grow through challenges as well as in times of comfort. I loved meeting the author, but what did I think of the actual book? Mixed feelings. It wasn’t my type of book, too much reality, I like fantasy… yet, I couldn’t put it down. I didn’t relate to the the high-tech world of software engineers, there were no plants involved….yet, I couldn’t stop turning the pages. I found some of the characters less than believable, yet my eyes filled with tears on the last page. I felt like he had something there, something good, but it could have been even better with a few changes. There were two stories going on, one of espionage in the world of silicon valley and the other of raising an autistic son. The two never meshed well for me. I just didn’t like how they fit together. I wanted more character development. Who were these people and what drove them to who they were? For instance, the character Carolina. I was not convinced of her motives. I needed more to help me understand her devious ways. I just didn’t believe it. Parts of the book were confusing. From the opening chapter I wasn’t quite sure what was happening. I take it as a bad sign when I have to re-read the first few pages, trying to understand what the heck is going on. I’m not sure I ever did. Who are these people? Why were they doing this? These were a few of my questions as I read the book. But, like I said, I kept on going through all 440 pages. I was invested, I wanted to find out what happened. I did care about some of the characters, Dan for instance. So it’s a mixed review. I’m impressed with anyone who can actually write and publish a book and I look forward to what Jon Rosenberg has to offer us in the future. I really admire him for what he has done and his beautiful philosophy on life. He is an amazing man and I wish him the best of luck! Thanks, let’s do this again! Thanks Elaine. It’s always nice to get recommendations for book club reads!